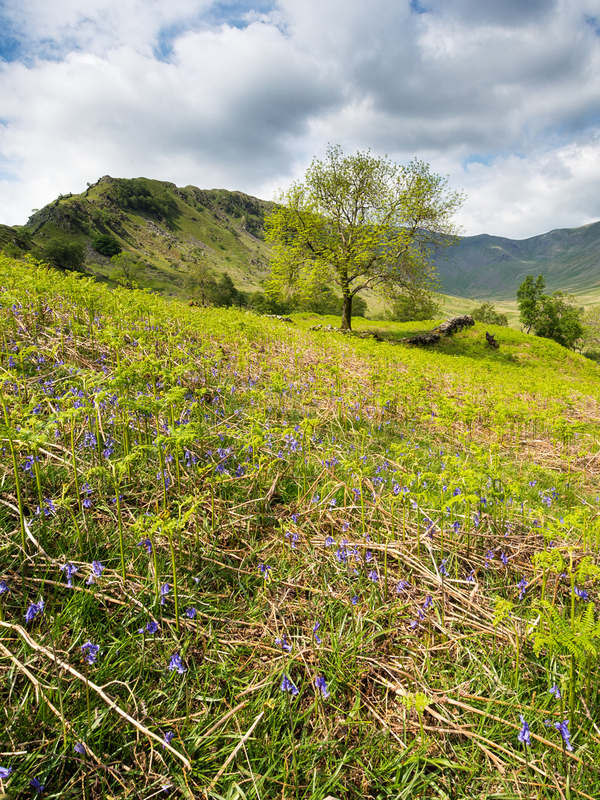 One of my Haweswater images from the weekend shot on the Olympus OMD. It doesn’t show the lake but it does show the start of the ridge in the background that we would later be walking up. I am feeling happy once more. My frustration with not taking my camera out has subsided somewhat. At the weekend just gone I was up in the Lake District with my new camera at one of the best locations you can imagine – Haweswater. Unless you are familiar with the Lakes it’s unlikely you have visited this spot and yet it’s one of the most spectacular. It lies near to Penrith and is away from the usual tourist destinations. It has one narrow lane that leads to a dead end at the head of the valley where the lake also ends. Well, I say lake but it is actually a manmade reservoir. When it was created the designers were careful to create a number of features that blend it into the landscape. I suspect they must have been photographers as it’s so picturesque. The purpose of this blog is not to bore you with details of the location but to share a new problem now that I have gone totally lightweight. I couldn’t find a bag that suited the equipment I wanted to carry. For the day I had decided to take the Olympus OMD and the GX1 Infrared body. In addition to batteries and memory cards I also took a few lenses; the Olympus 9-18mm, Panasonic 14-45mm, Panasonic 45-200mm and the Olympus 12-50mm that came with the OMD. This was too much equipment to fit my small shoulder bag but it wasn’t enough to warrant carrying my Lowepro Mini Trekker. At the same time, because we intended to walk one of the ridges leading up to the summit of Highstreet, so I also needed to take a traditional backpack with outdoor gear. Oh yes, I also wanted to take the Sony RX100 as a backup. I did think of using a Sling shot but it would have been that little but too heavy and I need to watch my back/neck. Interestingly my friend had the same issues with his kit which is also Micro 43. As you can imagine, the conversation soon turned to the inadequacy of most camera bags to cater for Compact System Cameras such as the Olympus and Panasonic. Particularly those of us who want to combine this with day treks in the hills. Since returning I have been scouring the internet trying to find something that meets my needs but most of the bags are either a shoulder bag or designed for DSLR sized cameras, making them quite bulky and heavy. What I am really looking for is a lightweight bag which is either a back pack or a front pack. If it’s a backpack it needs to hold my waterproof clothing and extra layers in winter as well as food and of course the camera equipment. It needs to be the correct size for the Micro 43 camera as I don’t want wasted space of lenses rattling around. The alternative I think would be a front pack and I think this would be more practical as it would allow access to gear without needing to remove the bag. It should however be light and again suitably sized for the Micro 43 equipment. If it’s a front pack it needs to include some sort of shoulder of neck strap to prevent the pack hanging too low as you walk. It must also allow me to still wear a backpack for my clothing, emergency shelter, first aid kit, food etc. Now I don’t think this is too much to ask for but I haven’t yet found it. I did come across some bags last night that look promising. They are designed for press photographers who work in the field and need to keep mobile and on their feet. The bag strap to your front and over one shoulder to allow easy access to kit but I need to do more research; they may still be too bulky. If you are a bag manufacturer and reading this, let’s see some serious bags aimed at Micro 43 cameras and don’t try to brush us off with your SLR line rebadged. If you are a Micro 43 photographer who has cracked this problem I would love to hear your solution. I’ve got a Billingham digital that’s designed to take an SLR and kit lens, but (when you move the velcro’d internal bits about) makes a reasonable home for an M43 body with lens attached, and a few other bits. I sometimes put it in the top of a rucksack, though the strap does become a bit bulky at that point. I’m not recommending it as a bag-to-go-in-a-rucksack, as I don’t find it that practical having to get a load of bits out of a separate bag while I’m out walking, and I tend to take fewer pictures if I don’t have everything to hand. I’ve also got Billingham Hadley Large. It’s not really suitable for your purposes (a bit big). A friend with a GX1 and 4 lenses has the small, and adores it. We were walking in Scotland recently and he had the bag hanging in front of him somehow – it looked quite cunning. I’ll start a new comment to explain where I’m up to in this (probably never ending) journey; it doesn’t involve a bag at all. I have just seen your comment and it’s brilliant. Thanks for sharing this. I just ordered the new Mirrorless 30i by Think Tank Photo after much review. I am not convinced it will be what I want, but we will see. Their Retrospective 5 & 7 are highly thought of also. The Billingham’s are nice, but very expensive. Thanks. It’s the think tank bags that I have been looking at . They seem to have a front pack with shoulder strap. Let me know what you think when you get it. I am interested to hear a real world perspective. Following-up a previous post, I use both a Retrospective 7, which is cavernous for M4/3 and the smallest lap-diagonal, which isn’t quite big enough. However, I cannot help but feel that you delight in making a rod for your own back. Beg, borrow or steal the Pan 12-35, take a card-full of test shots, and you will never look back. I look forward to your Review. Yes, a rod for my own back. I am just picky. You certainly like your gear judging from the blog post on weight watching. I will probably change my mind again however. Have a look at Peli they do soft bags as well as the hard plastic, I changed a few years ago because of a bad back, I had been using an Expedition 7 but the rear pad was causing me problems. The bag I have has grip handles, shoulder straps and backpack straps; also has tripod straps on the underside. It’s also extendable each end, ideal for clothing and snacks, top and side access to your gear helps, as does a 5 year warranty. I had a quick look at this and as always it’s great to find out something new. It’s not what I am looking for but as I say, I wasn’t aware of this. I always use a front pack when hiking and utilize Op/Tech USA system connectors to fit it to my backpack. I have 4 (don’t ask) backpacks for hiking and have fitted either uni-loops or reporter/backpack connectors to the backpack shoulder straps. The front pack can be connected with the swivel hook connectors and height adjusted easily. I’ve used this setup successfully with Lowepro, Tamrac & Kata zoom bags and also carry my DMC-LX5 this way by using mini-QD loops and 3/8″ webbing connectors. Thanks David. This sounds very interesting and something along the lines of what I was trying to achieve. Can you point me to any websites so I am clean on the leemnts of your set up? I also understand the need for multiple backpacks (one for summer day walks, one for multiday summer walking, same again x2 for winter to carry the additional kit – ice axe, crampons etc.). Don’t get me started on boots though – I have 8 pairs all with different uses. Thanks Gain. Off topic for this post. Have you tried the LVF2 viewfinder with the GX1? How are you finding the viewfinder on the OMD? Yes I have the LVF2 for the GX1 and do somethime use it. I don’t use it as much as I thought I would as it tends to catch when trying to put the camera back in the bag. It is a very good viewfinder though and its really my personal choice not to use it. The only thing I would say against it is the price. How can they justify such a high price. The Olympus viewfindre is excellent also. It is however part of the camera and so designed into the frame of the body. I really like using it and use it much more than the viewfinder on the GX1. It somehow feels natural to bring this camera up to your eye but not so with the GX1. It terms of quality I would say they are on a part. The Olympus seems a little brighter but I think this is because it’s shaded more when you are looking through it; there isn’t as much light straying in from around the edge of the viewfinder. The neat trick the LVF2 can manage howevr is to be tilted to 90 degrees. The OMD can only tilt it’s screen. When I’m out walking, I’m not just there to take pictures. I want to enjoy my walk, while giving myself the best chance of getting some good photos. I love a good prime lens, but the dilemma is obviously which to take. I walked up Snowdon with my GF1 and discovered that when I had the 20mm mounted, I’d often want to swap to the 14mm. Sometimes I’d want the 45mm. It was a pain. I got a few crackers, but also took more totally average shots than I realised I was taking at the time. Not long after that I went up Catbells with just the 14-45mm zoom. This worked much better (which surprised me, as I generally don’t enjoy using zooms); I could spend more time on making images before catching up with the rest of my party. I had the camera on a wrist strap, so I never had my right hand free. It was a little irritating, but preferable to having to dig it out of a bag all the time. I’ve got a little belt pouch that the GF1 fits in with a pancake lens on, but I had no idea which pancake to take. Last month I cycled through the cambrian mountains. I used 14-45 again with a graduated ND filter mounted permanently on the front, ready for use in my handlebar bag. The weather was stunning and I took some beautiful shots, but mostly at 14mm (all around me were fabulous hills – I wanted to get it all in!). When I saw the pictures on the computer and showed them to my mates everything looked less impressive. The wide angle effect had shrunk the mountains. Last week I climbed Ladhar Bheinn (a munro in Scotland). It was the most impressive mountain I’ve ever climbed, and involved a fair degree of scrambling. I knew I’d have to keep the photography simple; it was a 12 hour walk, we were setting off late, and I didn’t want to be taking time to change lenses. I took my X100. It’s far better at the colours found in nature than the GF1 (whose RAW files I rate highly, but the greens can’t compete with the X100). The X100 has a fixed lens (equivalent to 35mm on a 35mm negative). I knew I’d be able to get a lot of stuff in, I could crop a bit if I wanted to, and that there’d be the odd shot that it wasn’t wide enough for. Maybe the 28mm focal length would flatten the view too much anyway. No matter; I knew I’d come back with some photos that looked awesome if I just used the 35mm (equivalent) prime. So importantly, I’d realised I didn’t have to try and get a great shot of *everything*. I did take the X100’s wide angle adapter (a screw on lens that takes you from 35mm to 28mm – I thought it might be handy to get more in). I put it in a little lens pouch and stuck it in the top pocket of my rucksack. So this is the bit I’m leading up to; how I carried it. When I’m out to take photographs I always use a wrist strap. I don’t like shoulder straps. However, I’d just bought the leather case for the X100 (which comes with a shoulder strap) and and it looked beautiful. I’d fitted it just to try it. The strap is the perfect length to go over my head and under one arm, leaving the camera hanging close to the side of my chest. We scrambled and climbed up some steep slopes, but the camera (unprotected other than for a leather half case) couldn’t swing far enough to hit a rock. I’d taken the lens cap off and stuck it in my rucksack, and put a solid metal lens hood on. It protected the lens amply throughout the walk. To take a shot all I had to do was pull my arm through the strap while the camera was powering up, lift it to my eye, and shoot. I came away with the most amazing collection of photos I’ve ever had on one day. Part of that was scenery, but part of it was the focal length. It wasn’t so wide that the large mountains have lost their grandeur, but it’s wide enough to get a decent amount of mountain in shot. The X100 also has a fairly capable panoramic stitching mode (so long as you don’t shoot into the sun, that is), and I used that quite a bit. The wide angle adapter went on for two shots, then came straight off again. The mountains lost their sense of scale. If I was carrying an OM-D these days (whose colours are probably up there with the X100’s) I’d take one prime on the body, and a wider one in a little protective pouch in the top of my rucksack. Keeping it simple works far better for me. Whether you take a couple of primes or one zoom doesn’t matter; the point is that you only need minimal kit. I get that you’re doing ultra wide stuff too, so two bodies make sense. I’d be for finding a great way to set those two bodies up, put all the paraphernalia in your rucksack (and leave it there), and hook the cameras onto your person so that they’re readily available. And on the subject of simple, when you’ve got an OM-D and a GX1 with you, what the heck do you need an RX100 for? That doesn’t sound like a backup. It sounds like you love your cameras and want to take them all with you. Fair enough (been there), but I get better results when I prevent myself from focusing on the gear. Interesting post though, thanks. I hope I’m not sounding too opinionated, it’s all a very subjective/personal thing. Some interesting points. Just to answer some of your questions at the end, the RX100 is a backup and stays in the backpack. I have been paranoid ever since out on a trip with a friend and her 5D failed and she didn’t have a backup. It took us all ages to stop laughing – sorry Cath. I actually carry 3 zooms but they don’t overlap. There is the Olympus 9-18, the Panasonic 14-45 and the 45-200 (but I have been tending to leave it at home). The important difference between the Olympus OMD and the GX1 is that my GX1 has been converted to only shoot Infrared so everything is in near monochrome. The GX1 often is just the body as I find the lens that I want to use is often on the other camera. The OMD is now my Landscape Camera. Yes I carry a lot of kit but if I am on a serious hike I tend to just take one camera, the 9-18 and the 14-45. If I am out for serious photography I take more but I still need to be prepared for whatever weather the hills throw at me. I like your solution. I think its elegant and despite having all these lenses with me I find I shoot more often than not at 35mm (in full frame terms). Good point on the IR conversion – I’d read your post about that but had forgotten. That does rather change the backup situation. I rather fancy getting an OM-D, for which carrying the two zooms you do makes a lot of sense, but there’s a danger I’ll just throw myself back into the dilemma of choice. I’d need to learn better discipline in what I shoot first (i.e. only the stuff I think is really good). I have to say that I am really impressed with the OMD. It also improves dramatically when you attach the additional grip. The image quality is superb.